Another poster of the upcoming film Bharat has been released. Salman Khan took his social media account and shared another poster that also introduced the character of Katrina Kaif along with his 70s look. The makers of the film have described Bharat as a journey of a man and the nation together. The plot of the film follows the protagonist’s journey through different phases of his life that showcases his different looks. 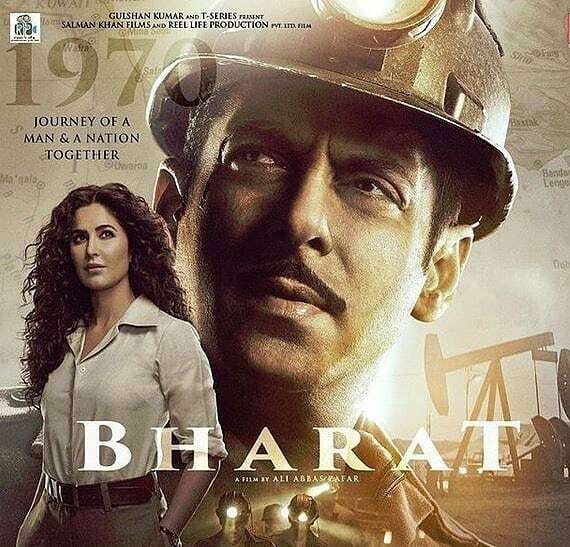 The new poster has shown Salman as a miner while Katrina seems to be in his in-charge officer. Salman shared the new poster and wrote, “Aur phir humare zindagi mein aayi ‘Madam Sir’😉 #KatrinaKaif #BharatKaJunoon”. Bharat is one of the most awaited films of 2019 and is helmed by Ali Abbas Zafar. The film also stars Disha Patani, Tabu, Sunil Grover and Norah Fatehi playing important roles. Bharat is the official adaptation of the 2014 South Korean film Ode To My Father. Salman had first shared a glimpse from the film featuring himself and Katrina in August, 2018. The trailer of the film will be showcased with the film Avengers: Endgame that will be releasing on April 26, 2019. The music of the film is composed by Vishal-Shekhar and the film is scheduled to be released on June 5, 2019.